Removing part of a kidney with minimally invasive robotic surgery rather than an entire kidney when operating for smaller tumors is often best for patients from a recovery and health standpoint, but many surgeons hesitate to do so because of the complexity of the robotic partial nephrectomy procedure. Investigators with the Vanderbilt Institute for Surgery and Engineering (VISE) hope to change that by developing an image guidance interface for robotic surgery systems. This will give doctors a three-dimensional map of subsurface tumors, delicate blood vessels and other structures before they make incisions, so that they can cut in exactly the right place. A Vanderbilt team led by a urologic surgeon and biomedical and mechanical engineers has received a four-year National Institutes of Health (NIH) grant to develop enhanced software that will create a “surgical GPS” system to provide intraoperative guidance to surgeons performing partial kidney removal with the da Vinci robotic surgery system. According to National Cancer Institute statistics, an estimated 64,000 new kidney cancer cases will be diagnosed and more than 14,000 deaths will occur in the United States in 2017. The rate of new kidney cancers has been rising since the 1990s, although this has leveled in recent years. Part of the increase was likely due to improved imaging that detected tumors that might not have been found otherwise, Herrell said. 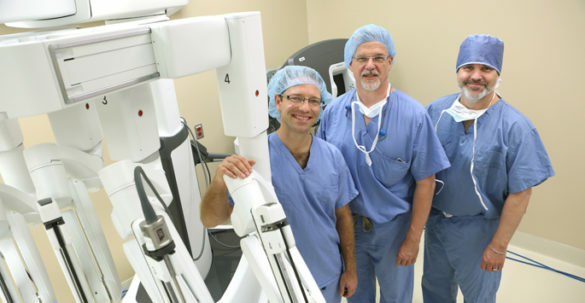 Herrell performed the first robotic partial nephrectomy at Vanderbilt University Medical Center (VUMC) in 2009, and he is one of a small number of urologic surgeons in the United States who now perform a large number of these minimally invasive surgeries. Many surgeons remain hesitant to provide these precise surgeries because there is no direct imaging system to assist them, and the vessel and tumor anatomy is often complex, Herrell said. “CT and MRI scans provide great information before the case, similar to a good map, but we lack methods to use them optimally in real time in the operating room,” said Herrell. “The best analogy is that when I was young, my family drove around with a big road map atlas. The maps might be 5-10 years out of date, and we had no idea where hazards might be. Now, we have real-time navigation and traffic apps that warn us when there is a pothole 20 feet ahead and help guide us to the best routes. People don’t drive using maps anymore. Everything is about immediate information. VUMC has six da Vinci robotic surgery systems, including two of the most recent model, the Xi, which were delivered in September. Robotic surgery allows surgeons to perform complex tasks through tiny incisions with improved precision and stability. There are more than 4,000 da Vinci robotic surgery systems in use worldwide. During the investigation, the team will use a novel clinical testing approach in which one surgeon performs a procedure using the da Vinci system while another physician tests the new image guidance display on a parallel da Vinci surgeon console, but doesn’t perform any surgical actions. This way, information on the accuracy of image guidance information can be gathered without impacting the surgery itself. After the software is developed and tested, the group plans to move forward with a randomized, multi-institutional study of the technology. Herrell, Robert Webster III, Ph.D., associate professor of Mechanical and Electrical Engineering, and Michael Miga, Ph.D., Harvie Branscomb Professor and professor of Biomedical Engineering, lead the research team. All are members of the VISE Steering Committee and key founders of VISE. Herrell first began working on this concept several years ago with now retired VU Biomedical Engineer Robert Galloway, Ph.D., and NIH funding for their grant proposal was imminent when federal research dollars were reduced. Herrell received financial support through VISE to be a physician-in-residence in 2016, allowing him to work one day a week in an engineering laboratory and push forward on the grant. The research team credits VISE and the support of the leadership of both VUMC and Vanderbilt University for the project’s progress from concept to funding. VISE was formed in 2011 when engineers and surgeons came together with the goal of breaking down collaboration barriers between the two groups so they could pursue innovative projects in surgery and health care. VISE now includes more than 30 faculty members from the Schools of Medicine and Engineering who have acquired more than $25 million in active grants.